For $28 plus gratuities, children can enjoy assorted glazed fairy land doughnuts, marshmallow faces, smarties, rainbow lollipops, assorted marshmallows, Pokeman Go cake, assorted mini cupcakes, chocolate cones, crispy treats, cinnamon pops, chocolate crunch with teddy bear smarties and ice cream station with condiments. “I would like to thank Hamilton Princess & Beach Club for hosting this fun event in support of Family Centre,” said Martha Dismont, executive director of Family Centre. 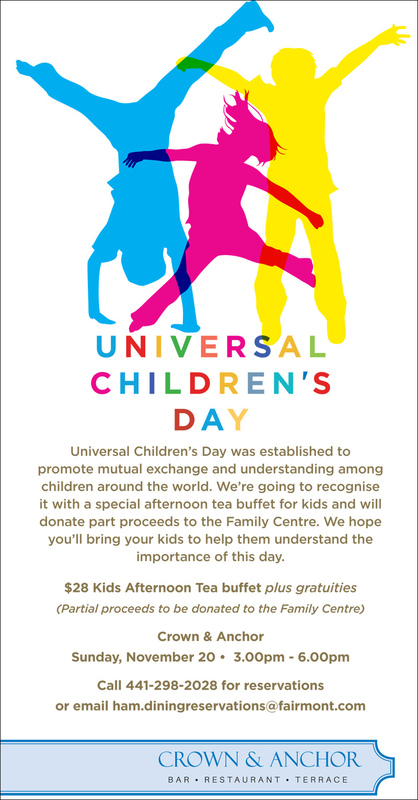 “Universal Children’s Day was established to promote mutual exchange and understanding among children around the world,” said Allan Federer, general manager, Hamilton Princess & Beach Club. Adults accompanying children can order Afternoon Tea for $48, plus gratuities. For reservations, call 298-2028 or email ham.diningreservations@fairmont.com. For more information about Family Centre, visit www.tfc.bm.